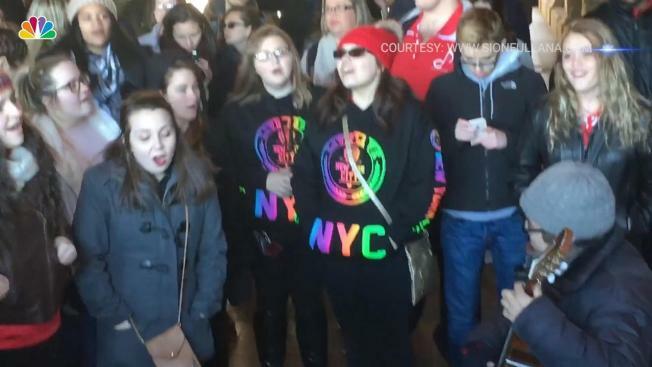 There is some magic that can only happen in New York City. Sion Fullana and his husband Anton were visiting the city last month when Fullana caught some of that New York magic on camera. On the last day of their visit, the couple stumbled upon a proposal near the entrance of Bethesda Terrace: a young man down on his knee, his happy new fiancee and a cheering and applauding crowd. As the newly engaged couple walked away Fullana said a street musician’s guitar began to fill the noisy, Central Park streets with the tune of John Legend’s song, “All of Me”. The crowd began to sing along, and he pulled out his camera. 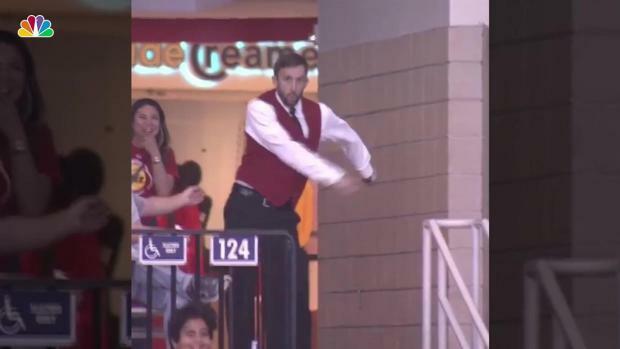 An usher at a Houston Rockets game stole the show when the dance cam turned on him this week. The Houston Rockets posted the video to Instagram Wednesday saying, "our dance cam has been full of surprises all season." It's had more than 400,000 views. Whether the group was strangers, tourists traveling together or a group of disparate New Yorkers with incredible voices, Fullana had captured it all on film. Fullana has his own New York love story, too, so the Big Apple has a special place in his heart. He and his husband had met in Barcelona in 2004 when Anton was visiting from New York. Separated by a whole ocean, they decided to begin a 14-month, long distance relationship. Eventually, Fullana moved to the city to live with Anton. The couple called New York home and married in 2011. They lived in the city for a decade until family matters called Fullana and his husband back to Spain. But after two years, they finally came back to visit New York, where they were to stumble on this special Manhattan moment. “Ten days didn’t amount to anything, with all the people we needed to see, places to go ... What was certain, however, was how much it felt like home,” Fullana said.